Boosted to an altitude of 3,604 miles by a powerful Delta 4 rocket, NASA’s Orion deep space exploration vehicle fell back to Earth Friday in the program’s maiden voyage, slamming into the atmosphere at nearly 20,000 mph, enduring a hellish 4,000-degree re-entry and settling to a Pacific Ocean splashdown to wrap up a critical unmanned test flight. 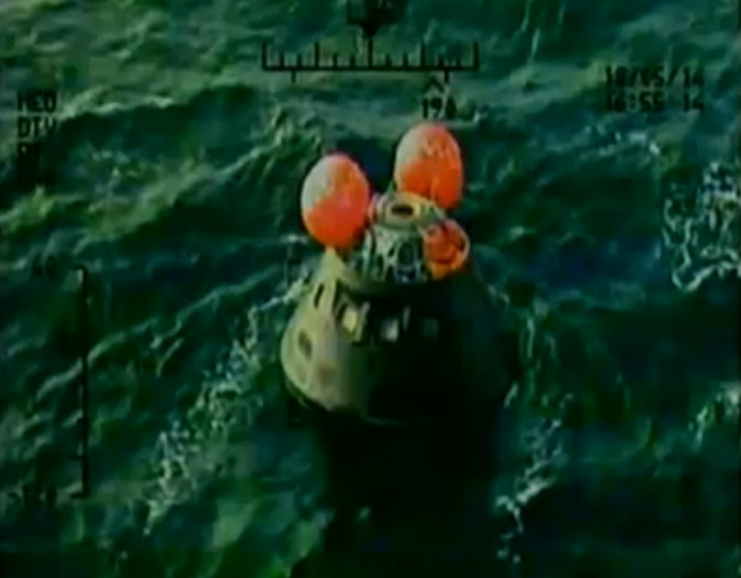 Navy recovery crews and NASA personnel stationed near the landing zone quickly moved into position to recover the spacecraft and its three huge parachutes, along with quick-look video of the capsule’s heat shield. Recorded video and data from more than 1,200 sensors will be recovered after the spacecraft is hauled back to port in San Diego. But the Exploration Flight Test 1 — EFT-1 — mission appeared to go off without a hitch as the Orion test craft sailed through one test objective after another, successfully jettisoning structural panels and a launch abort tower during the climb to space and then enduring extreme space radiation as it flew through and then beyond the Van Allen belts. Live television views near the top of the spacecraft’s trajectory provided spectacular shots of Earth from an altitude some 14 times higher than the International Space Station, the highest point any spacecraft designed to carry astronauts has reached since the final Apollo moonshot more than 40 years ago. Appropriately enough, a small lunar soil sample made the trip back into orbit aboard Orion along with a part from an Apollo lunar suit and a variety of other mementos, including a “Star Trek” Captain Kirk action figure and an assortment of flags, medallions, patches and pins, according to collectSPACE. Falling back to Earth after separation from the Delta 4’s second stage, the Orion capsule’s flight computer fired thrusters to properly orient the spacecraft for re-entry and the spacecraft plunged into the discernible atmosphere 75 miles above the Pacific Ocean around 11:18 a.m. EST (GMT-5). Quickly slowing as it descended into the thick lower atmosphere, Orion’s 16.5-foot-wide heat shield was subjected to temperatures of some 4,000 degrees Fahrenheit following a trajectory designed to provide 84 percent of the velocity and heat that would be experienced by a spacecraft returning from the moon. Dropping below 25,000 feet and descending at about 300 mph, a protective cover was jettisoned from the top of the spacecraft and two 25-foot-wide drogue chutes deployed to slow and stabilize the capsule. 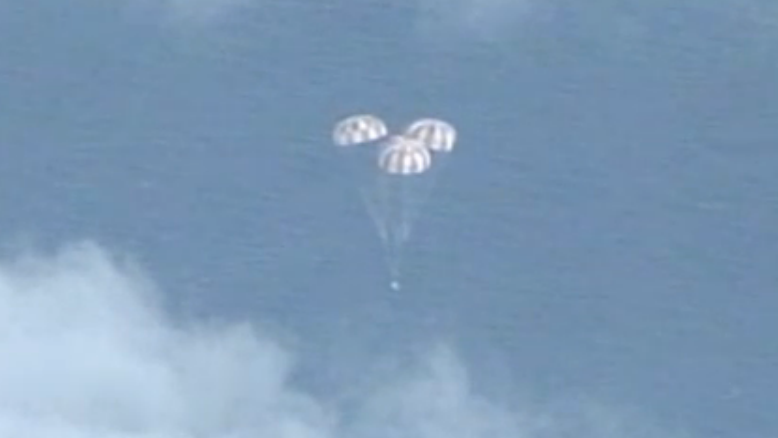 Thirty seconds later, at an altitude of about 8,000 feet and a descent velocity of about 100 mph, the drogues were cut away and three pilot chutes pulled out Orion’s three main parachutes. The capsule splashed down on target and within sight of recovery crews, about 275 miles off the coast of Baja California and some 630 miles south of San Diego. 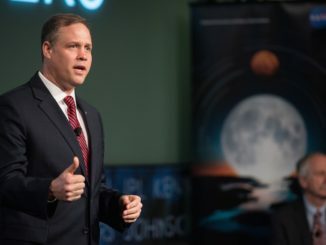 While NASA’s budget is constrained and flights to Mars are not expected before the mid 2030s at the earliest, the launching Friday generated widespread interest and served as a major morale booster for NASA and its contractor workforce. “It’s biggest significance is symbolic,” space historian John Logsdon, founder of the Space Policy Institute at George Washington University, told CBS News. “This is the first time a piece of hardware intended to take humans beyond low-Earth orbit is being tested or used, for 42 years, since Apollo 17. 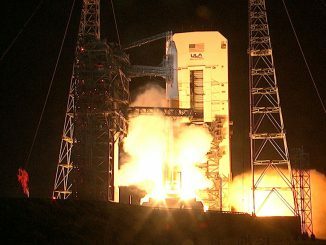 The long-awaited mission got underway at 7:05 a.m. when the heavy-lift Delta 4’s three hydrogen-fueled main engines ignited and throttled up, generating nearly 2 million pounds of thrust and a fiery torrent of exhaust. The 242-foot-tall rocket, tipping the scales at 1.6 million pounds, majestically climbed away from pad 37 at the Cape Canaveral Air Force Station. The launching was delayed one day because of a variety of issues Thursday, including a boat in the off-shore launch danger zone, higher-than-allowable ground winds that triggered two countdown interruptions and sluggish propellant fill-and-drain valves used by the three booster cores making up the rocket’s first stage. The valve problem was blamed on prolonged exposure to ultra-low temperatures, and engineers implemented a plan to make sure they would work smoothly the second time around. 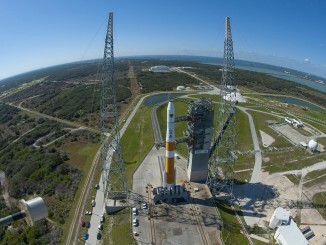 The valves worked normally during Friday’s countdown, clearing the way for launch. Making only its eighth flight, the Delta 4 “heavy,” the most powerful rocket in the current U.S. inventory, put on a thrilling sky show for thousands of space center workers, tourists and area residents as it arced away to the east over the Atlantic Ocean. Four minutes after liftoff, two of the three common booster cores making up the Delta 4’s first stage shut down and fell away, followed a minute and a half later by shutdown and separation of the remaining first stage core booster at an altitude of about 90 miles. The rocket’s hydrogen-fueled second stage engine then took over, firing for another 11-and-a-half minutes to put Orion into an initial orbit with a high point around 550 miles and a low point of just 115 miles. Along the way, three large support panels were jettisoned as planned from the Orion’s service module followed a few moments later by jettison of a dummy launch abort tower and spacecraft fairing, exposing the capsule to the space environment. A second four-minute 42-second firing of the second stage RL10B-2 engine was carried out at the end of the first orbit to raise the high point of the second orbit to 3,600 miles, higher than any spacecraft intended for piloted operations since the final Apollo moon mission. The primary goals of Exploration Flight Test 1 were to subject Orion’s heat shield to the rigors of re-entry and to make sure its computer hardware, software and navigation systems could endure the higher radiation levels found outside the protection of the Van Allen belts that shield space station astronauts. Equally important, engineers wanted to verify the performance of the giant braking parachutes and the pyrotechnic systems needed to jettison the service module structural panels, the capsule’s launch fairing and dummy abort motor and the protective parachute cover. “This test flight is a big, big deal because it’s going to give us an opportunity to demonstrate three big things about the vehicle,” NASA Administrator Charles Bolden told CBS News earlier in the week. “One, that it is capable of withstanding the temperatures and pressures of re-entry, so we’re looking at the heat shield and the structure itself. The results of EFT-1 will be fed into the next Orion capsule, already under construction, that will fly in 2018 aboard the maiden flight of NASA’s new Space Launch System mega booster designed to propel astronauts on deep space missions. If all goes well, astronauts will strap in for Orion’s first piloted test flight aboard an SLS rocket in 2021. NASA’s long-range plan is to use the new rocket and capsule to collect samples from a captured asteroid in the mid 2020s before an eventual flight to orbit and land on Mars in the 2030s. But that will depend on NASA’s budget and the continued support of multiple administrations and Congress. “The American public and their representatives in Congress and the president don’t seem to be willing to pay the money to do it any faster,” Logsdon said. “NASA’s doing the best it can on something like a starvation budget. Every external review that’s looked at the program for the past 25 years has said NASA needs more money, you’re trying to do a 20-pound program in a 10-pound bag.